Though very early in the season, KPI Rankings for men’s basketball are now posted. Conference data through the first ten days of the season is also live. The early story of the season has been the scoring has dropped 7.4% and returned to levels seen before rule changes were instituted for the 2013-14 season. All data points below compares the first ten days of the 2013-14 season and the first ten days of this year and is computed on a per team, per game basis. 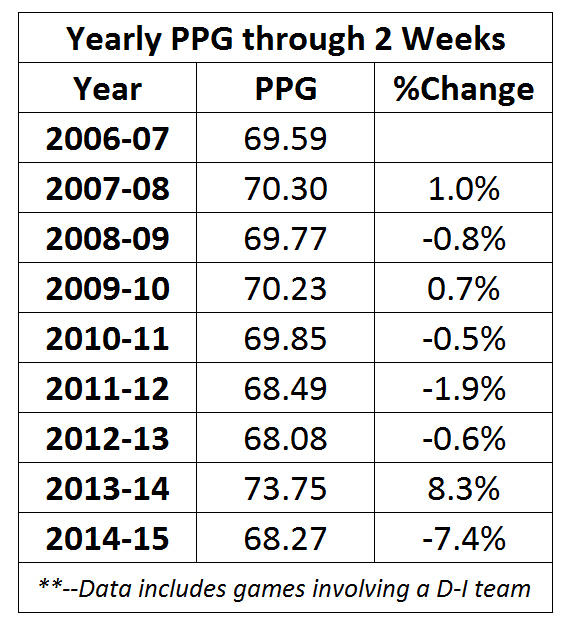 Possessions are down 2.6 per team, per game (from 71.4 to 68.8), a decrease of 3.6%. Scoring is down 5.5 points per team, per game, a decrease of 7.4%. With possessions also down, points per possession are down 4.0% (from 1.033 to 0.992). Scoring is up 0.28% (up 0.19 PPG) between 2014-15 and the 2012-13 season. 1% of the scoring decrease is tied to fewer made free throws, 54.1% from fewer made 2-pt field goals and 1.8% from fewer made 3-pt field goals. The average length of a possession was 16.89 seconds over the first ten days of the 2013-14 season, while the average length has been 17.54 seconds to date this year (an increase of 0.66 seconds per possession, up 3.9%). Field Goal Attempts per possession are nearly constant. 3-pt field goal attempts per possession are up slightly (2.7%). Rebounds per possession are also nearly the same. Free Throw Attempts are down 13.6% (3.29 FTA/game), and down 10.3% per possession. Steals per possession are up 6.7% and turnovers per possession are up 9.4%, reversing a trend that was tied directly to the increase in fouls and free throw attempts last year. 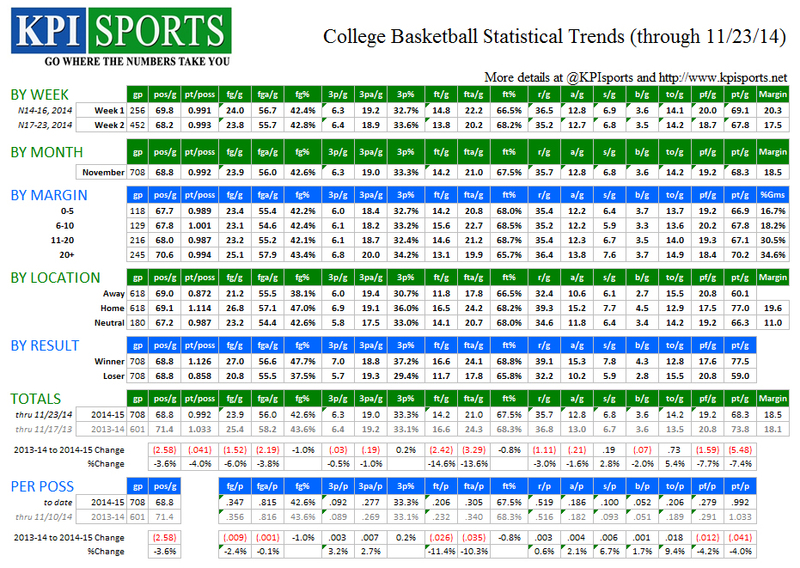 Personal fouls are down 7.7% per game (1.59 per team, per game), down 4.2% per possession. 1% of all games have been decided by 11 or more points. Miami (FL)’s 69-67 win at Florida on Monday is the best KPI win of the season to date (worth +.79) and leaves Miami No. 1 overall in the KPI. Kentucky scored 75.4% of the total points in a 86-28 win over Montana State on Sunday. That’s the highest percentage of total points in a game against a Division-I opponent this year. 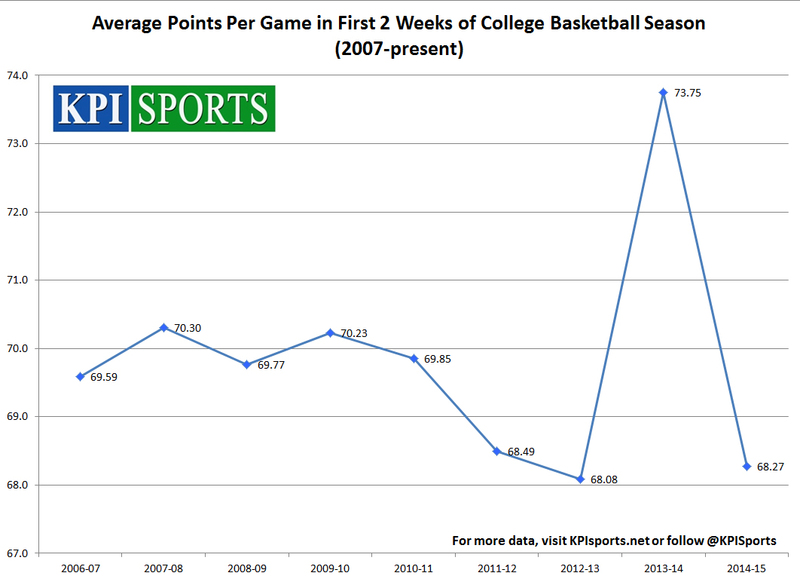 Posted in College Basketball, KPI Sports and tagged College Basketball, KPI Sports, NCAA.